When rain falls on the land much of the water (especially when there is sandy soil like that found in the Monterey Bay area) seeps into the ground. The water continues down through the soil until it hits an underground layer of clay or rock and can go no further. Scientists call such an underground layer an aquitard. When the water can go no further it accumulates in the soil on top of the aquitard. Scientists refer to water stored in the ground in this way as groundwater and the soil where the groundwater is found as an aquifer. Water in an aquifer can flow through the soil, just like water flows in a river, only much slower. 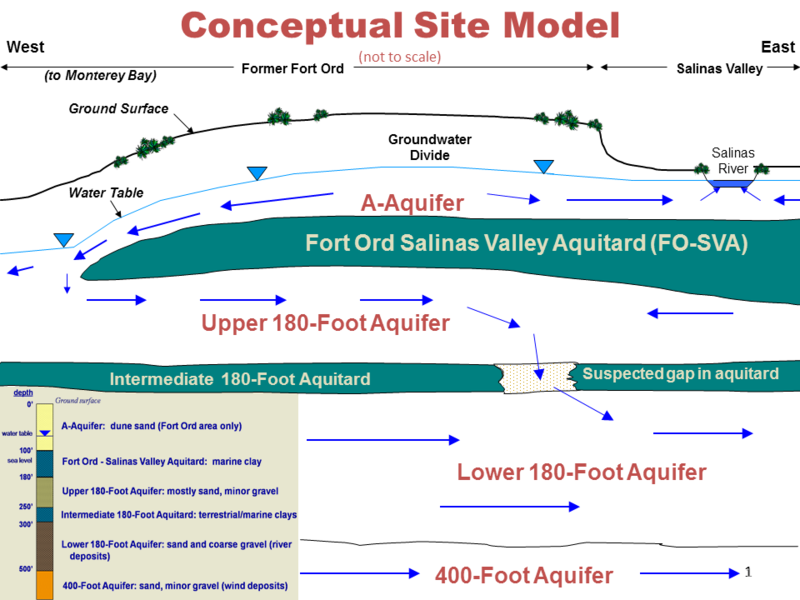 In the northern portion of the former Fort Ord, there four underlying aquifers that are of primary importance to the groundwater cleanup program, each separated by an aquitard. The upper-most, or shallowest, aquifer is called the A-Aquifer. The other deeper aquifers include the 180-Foot Aquifer which is split into the Upper and Lower 180-Foot Aquifers, and the 400-Foot Aquifer. These aquifers named based on their depth below ground surface in the Salinas Valley in the east. The A-Aquifer is the shallowest aquifer, between 60 feet and 100 feet deep, and is not used as a public water supply. The soil within the A-Aquifer is generally made up of sand or sandy soil that was sand dunes in ancient times. The Upper 180-Foot Aquifer has previously been used as a public water supply source, but does not currently supply drinking water to either the former Fort Ord or the City of Marina. The soil within this aquifer is made up of mainly sand with some gravel. Waste disposal in the Fort Ord landfill resulted in trichloroethene (TCE) contamination of groundwater in the A-Aquifer, the Upper 180-Foot Aquifer and the Lower 180-Foot Aquifer. This area is called Operable Unit 2 or OU2. Vehicle maintenance activities in the Main Garrison in the vicinity of 1st Avenue and 12th Street resulted in tetrachloroethylene (PCE) and TCE contamination of groundwater in the Upper 180-Foot Aquifer. This area is called Site 2/12. Training and equipment maintenance activities in the northern portion of the former Fort Ord (now the Abrams Park housing area) resulted in carbon tetrachloride contamination of groundwater in the A-Aquifer, the Upper 180-Foot Aquifer and the Lower 180-Foot Aquifer. This area is called Operable Unit Carbon Tetrachloride Plume or OUCTP. The cleanup of contaminated groundwater includes the capping of the Fort Ord landfill and the operation of groundwater treatment facilities that address three contamination areas. The Fritzsche Army Airfield fire drill burn pit groundwater treatment facility, Operable Unit 1, began operation in 1989 but treatment is complete. The Fort Ord landfill area groundwater treatment facility, Operable Unit 2, began operation in 1995. The groundwater treatment facility addressing the Sites 2/12 groundwater contamination plume is located at 1st Street and 10th Avenue and began operation in 1999. For the main portion of the Operable Unit Carbon Tetrachloride Plume, the Army is using a cleanup method called in-situ biodegradation. The majority of the groundwater contamination at the former Fort Ord is present in the A-Aquifer and the Upper and Lower 180-Foot Aquifers. There is a very limited amount of contamination detected well below drinking water standards in the Lower 180-Foot Aquifer and no contamination was detected in the 400-Foot Aquifer. It is very important to protect these aquifers because they are used for water supply. The water supply for the former Fort Ord community comes from wells referred to as Well Number 29, Well Number 30, and Well Number 31, which are all located in the northeastern part of the former Fort Ord. Each of these wells taps into the Lower 180-Foot Aquifer at a depth of about 300 feet to 400 feet below the ground surface. Well Number 29 and Well Number 30 also tap into the 400-Foot Aquifer at a depth of about 400 feet to 500 feet below the ground surface. The drinking water supply system at the former Fort Ord is operated by the Marina Coast Water District. Local drinking water supplied to communities on and around the former Fort Ord meets all drinking water standards. Supply wells on Fort Ord are tested frequently to ensure water quality is maintained. TCE has been found at a detectable concentration but is well below the Maximum Contaminant Level in the three supply wells that feeds the Fort Ord system. The Army and the Marina Coast Water District monitor this situation closely. The installation of new supply wells is restricted by the Monterey County Health Department in areas which may influence Fort Ord groundwater contamination plumes.